This section contains historical images that may reveal plot elements from later in the book. If you’ve already finished The Reservoir, read on. If you haven’t, be warned! New images will be revealed regularly. A brief story appeared in the Richmond Dispatch the day after the discovery of the body. Tommie saw it and hoped there would be no further headlines. 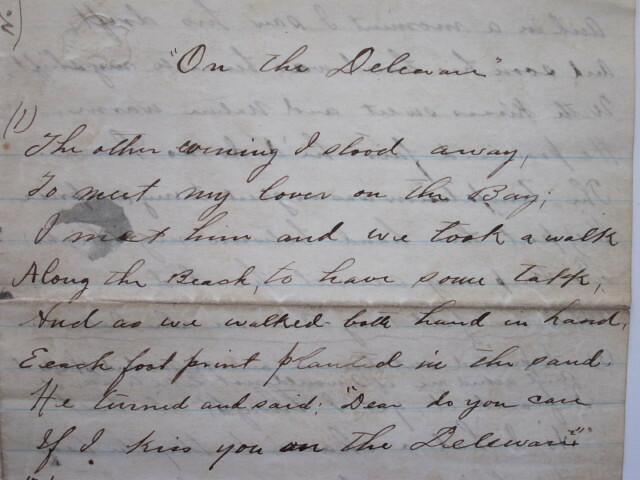 The only extant piece of writing in Tommie’s hand, this letter to Lillie was torn at some unknown time. He apologizes for not visiting her and suggests she should marry a “fellow” she was apparently interested in. 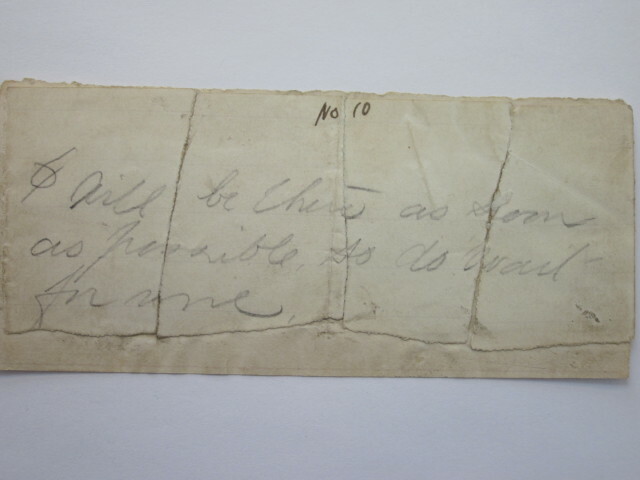 He expresses eagerness to hear from her and signs off, “Your fond friend T. J. Cluverius.” No other letters from Tommie to Lillie were ever found. Not long before her fateful trip to Richmond, Lillie asked Aunt Jane to lend her five dollars, no doubt for traveling expenses, rather than winter clothes. 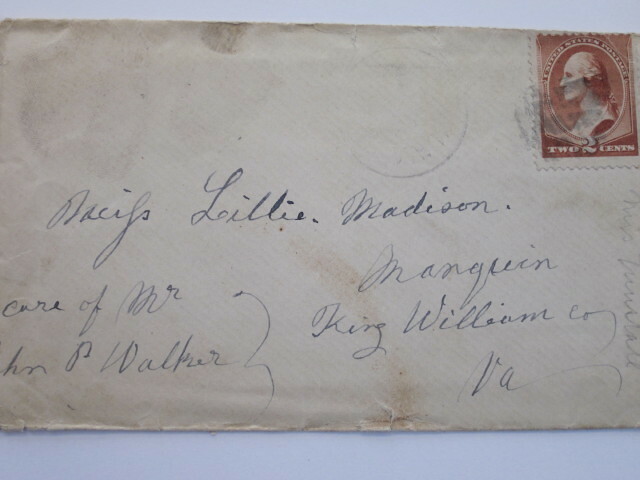 Lillie reputedly received this letter, ambiguously dated “March 1885,” from a friend requesting that she come help care for the friend’s aunt. 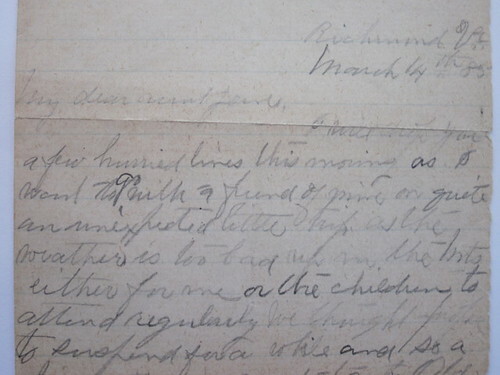 The prosecution argued that the letter was a ruse, concocted by Lillie and Tommie as an excuse to meet in Richmond. In the novel, we see them working on this letter together. In a hastily penciled letter to Aunt Jane, Lillie says she is going to visit a friend at Old Point Comfort, a resort at Fort Monroe at the mouth of the James. She dated it the day after she disappeared, and signed it “I remain always your loving & devoted Lillie.” Her mental distress can only be imagined. The “dirty poem” was discovered under the lining of Lillie’s trunk. It was unsigned, but the prosecution claimed it was in Tommie’s hand. The poem gets bawdier and cruder as it continues: “He began to blow and grunt, And finally pressed it up my . . .” and so on. This torn note was a crucial piece of evidence. It was reportedly found in a trashcan at the American hotel, inside an envelope addressed to Tommie. 1. How do feel about the character of Tommie? Are you convinced of his guilt or innocence? Tommie intrigued me from the start. Here you have a smart, well-spoken young man with a lot of potential to do great things, or at least to live comfortably and become a pillar of his community. He yields to temptation, as we all do from time to time, and then compounds his mistake by not owning up to it and confronting it head on. I think what makes his case different from the murder-of-the-week that we see all the time on TV is that he is himself unsure of his own guilt. The mystery of this whodunit lies in discovering what “it” is and why it was done. It’s clear early on that Tommie is guilty of something–we try to discover what that is by peeling back the layers of his complex personality. The final layer is the puzzling and mysterious nature of history, which can only be told by the survivors. 2. How did writing historical fiction differ from your previous experiences writing nonfiction? Did you draw inspiration from any other fiction writers? This book has been the most absorbing and satisfying writing experience of my life. Writing nonfiction taught me how to do the kind of research I needed for THE RESERVOIR, and it got me interested in American history. But the challenges of fiction are very different–having the story rely far more on one’s imagination than on the facts is both freeing and terrifying. Dostoevsky’s CRIME AND PUNISHMENT was an early favorite book of mine. You can’t read something that intellectually compelling without coming away inspired, influenced, and changed. Both Raskolnikov and Tommie think themselves extraordinary people, but whereas Raskolnikov is driven by an idea, Tommie is possessed by desire. Dreiser’s AN AMERICAN TRAGEDY was a huge help as I tried to figure out how to transform a true story into a novel. He created a masterpiece that at the time was criticized for being too long and having a protagonist who was too ineffectual. I wanted to avoid those issues, while creating something original. I was able to keep the length down by assuming–thanks to television–an audience familiarity with police procedurals and courtroom business, except where local and historical details differed from today. Other influential writers, for various reasons, include Fitzgerald, Keats, Capote, D. H. Lawrence, Styron, and Robert Penn Warren, to name a few. 3. As a lifelong Southerner, how important was it for you to convey a sense of place in the novel? Geography has always mattered to me, and I think it would no matter where I was from. Landscape and history are inseparable–a sense of place only deepens the field on which your characters go about their lives and struggles. 4. The novel is set in 1885, about twenty years after the end of the Civil War. How do you think this impacts the atmosphere of the novel? The war is a nearly constant background noise in this novel. Tommie’s generation is the new, postwar generation, but for the older folks–his parents, the lawyers, and many others, the war was the defining historical event of their times: The war shaped who they were in the 1880s. Richmond was in ruins after the Civil War; two decades later it had begun to emerge again as a major industrial and economic center. But it would be many more years before the Confederate capital could claim identity as something more than a proud loser. That explains to a large degree why this trial and the way it was prosecuted and reported were so important to the locals. 5. How long did it take you to write THE RESERVOIR? The short answer is three years, including a number of revisions. The long answer is that it took about twenty-four years. That’s how long I’d been writing fiction up to that point. I wrote several books that didn’t pan out, but all that time and effort were not a waste–when I finally came upon the right story at the right time, I had enough experience and patience to see it through. I’m very excited about my new novel-in-progress. 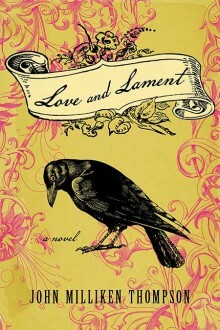 It’s about a girl who tries to understand why death plagues her family, and, in the process, learns to love. It’s set a little farther south and a little later in time–I’m finding the turn-of-the-century period won’t let me go. It’s a transitional time, the pre-modern era, when things were unsettled and uncertain. The main character is a girl who grows up in a large family and endures some very hard events; there’s some comic relief, though the main tone right now is elegiac. This novel is based on an actual court case, “T.J. Cluverius v. the Commonwealth.” A paragraph in a book on Richmond history got me digging deeper. I found copious newsprint dedicated to what became a sensational trial; it was wonderfully detailed, but it gave no clear idea of who the participants were, where they had come from, and why they ended up doing what they did. I continued to dig up as much as I could about the case, while doing general research on the period. Though most of Richmond’s early buildings have fallen to the wrecking ball, a good sample from various periods remains. Finding Lillian’s grave early on—which took more effort than I’d thought it would—gave me a tangible link to the story and made me feel committed to telling it with as much passion and honesty as I could. I soon realized that I was going to have to imagine most of the story. By this point I felt so connected to these long-dead people that I thought I owed it to them to get it right, which in fictional terms meant that the story would have to rise up out of the facts like a holographic image from a flat screen. But the question remained; what was the story? I was lucky in that the events of the case suggested a rough plot line, as all interesting court cases do. There was a real Tommie, Lillian, Willie, Jane Tunstall, Richardson, a shadowy character on whom Nola was based, and so on. In my research I came across key pieces of evidence, carefully preserved for more than a century: letters, photographs, and, most interesting of all, a watch-key and a torn note. I integrated much of this into the story, though not always exactly as it appeared in the actual case. While I have done my best to keep the novel true to its historical period, I have tailored the facts to suit the story’s dramatic purposes. Most of the pre- and post-trial story is of my own creation. For the trial itself I borrowed freely from the transcripts, employing the standard writer’s tricks of cutting, adding, and moving. Time was collapsed in some places—Tommie, for instance, spent much longer in jail than he does in the novel; the lawyers are composites and minor characters have been added as necessary; events such as Hatcher’s visits were filled out; and so forth. The details of the case, then, were the fence posts on which I hung the story. The tragic love triangle at its heart was my invention, but it was suggested by the facts. As to Tommie’s guilt, the record remains tantalizingly unclear. One can pore through pages of material and be convinced one way, then sift some more another day and completely change one’s mind. The following sources were invaluable: The Richmond Dispatch, Chataigne’s Richmond City Directory (1885), Cluverius: My Life, Trial and Conviction (Thomas J. Cluverius, 1887), Houses of Old Richmond (Mary Wingfield Scott, 1941), Old Richmond Neighborhoods (Mary Wingfield Scott, 1950), Richmond: The Story of a City (Virginius Dabney, 1990), Celebrate Richmond (ed. Elisabeth Dementi and Wayne Dementi, 1999), Richmond: A Pictorial History from the Valentine Museum and Dementi Collections (ed. Thomas F. Hale, 1974), American State Trials (ed. John D. Lawson, 1936), Along the Trail of the Friendly Years (William E. Hatcher, 1910), John Jasper (William E. Hatcher, 1908), William E. Hatcher (Eldridge B. Hatcher, 1915), Old Houses of King and Queen County Virginia (Virginia D. Cox and Willie T. Weathers, 1973), Old King William Homes and Families (Peyton Neale Clarke, 1976), Architecture of Historic Richmond (Paul S. Dulaney, 1968), and General Fitzhugh Lee: A Biography (James L. Nichols, 1989). View in full screen and click “Show info” to read captions. 2. Tommie and Willie are raised in large part by their aunt Jane instead of their parents. How do you think this affected the boys? What kind of a surrogate mother is Jane? Lillie also had to leave her parents at a young age—does this affect her in the same way?